You may have heard of PRObiotics. 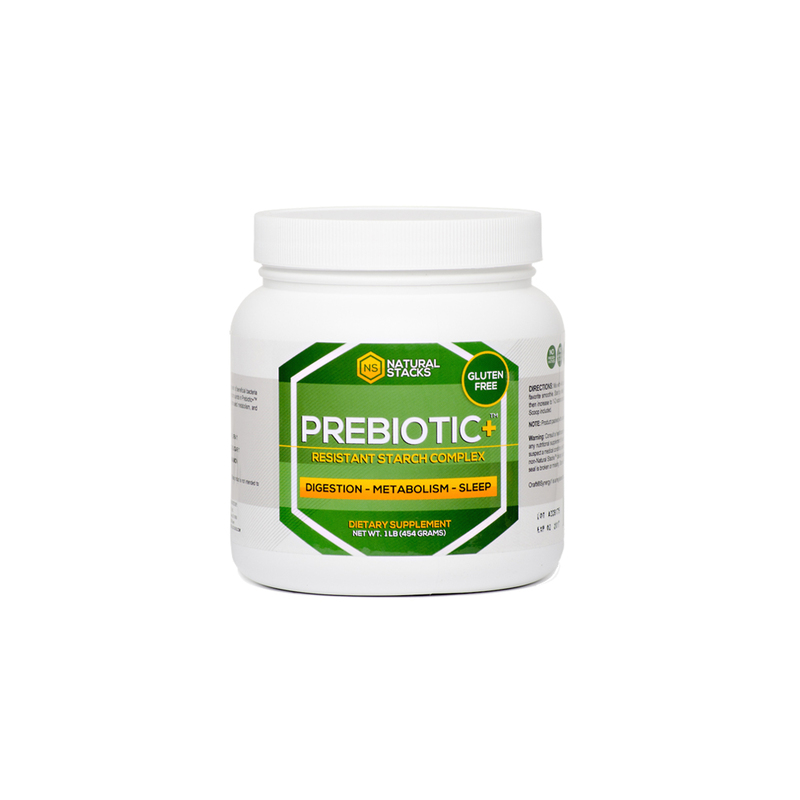 Probiotics are live bacteria found in yogurt, other dairy products, and some dietary supplements. .
PREbiotics are starchy plant fibers that can’t be digested by the body. This is why some prebiotics are referred to as “resistant starch”. The potato starch in PreBiotic+ is made from premium­grade high­starch European potatoes by an all­natural water and filtration process. Naturally found in many different vegetables, Inulin­FOS consists of short and long chains of fructose molecules. It helps to to reduce an increase in blood glucose after a meal. PreBiotic+ features Orafti ®Synergy1 Inulin­FOS, which is made from GMO­free chicory grown in Europe. Sometimes referred to as “mushroom sugar”, Trehalose is a naturally occurring sugar found in mushrooms, seeds, algae, and some drought­enduring desert plants. Unlike sucrose (table sugar), trehalose is only about half as sweet, has a much lower glycemic index, and a slow digestion process. Also known as “true cinnamon”. It’s also a rich source of antioxidants; just 1 teaspoon of Ceylon cinnamon has more antioxidants than 8 ounces of pomegranate juice. Natural Stacks is committed to using only the finest natural ingredients. Instead of finding low­cost sources of resistant starch overseas, we’ve selected the very best we could find. This ensures that you know exactly what you are putting into your body, and that you have the best experience possible with adding resistant starch to your diet. 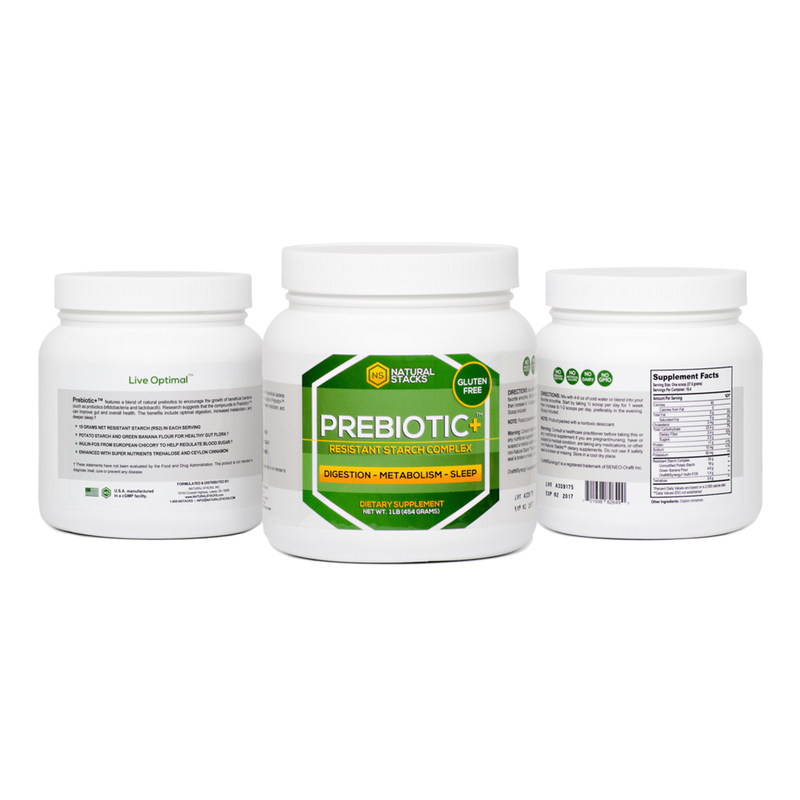 Prebiotic+™ resistant starch is a dietary supplement that falls within the category of fibers. Suggested Use: Mix with 4­6 oz of cold water or blend into your favorite smoothie. Start by taking ½ scoop per day for 1 week then increase to 1­-2 scoops per day, preferably in the evening. I’ve been using this product for almost three weeks and in that time I’ve been able to get higher quality sleep at night (according to the Sleep Time app) and I’ve lost another 4 lbs! Sure seems to be helpful. Still waiting to see if my health is improving. So far so good. Thanks for your product. I sleep like a baby when I take this in the late afternoon. Worked the first time. I gave some to 2 friends and they got the same effect as well. I also experience more « vivd » dreams. I will definitely re-order when I run out, another happy Natural Stacks customer ???? Helps settle the stomach and provides great nights sleep! The first night I tried this product I slept all night without interruption. I like this product very much and will continue to take this for a while.